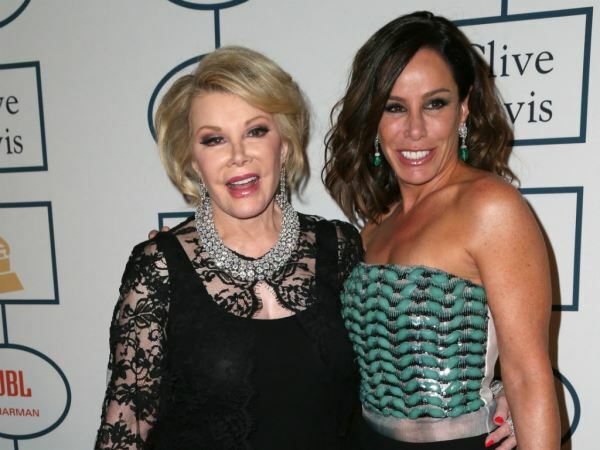 Melissa Rivers has blasted Kathy Griffin for "sh*tting over" her mother Joan's legacy. Joan was a panellist on TV show Fashion Police up until her death in September last year and was famous for her caustic comments about celebrities' style. Comedian Kathy took over after Joan passed away, but in March she announced she was leaving because she did not "want to use [her] comedy to contribute to a culture of unattainable perfectionism and intolerance towards difference." Up until now Joan's daughter Melissa, who also produces Fashion Police, hasn't remarked on the comments, but now she's let loose. "I’m just gonna say it wasn’t a match on a lot of levels," she told New York Post's Hoda Kotb at the 92nd Street Y. In her leaving statement, Kathy explained she thought she could use her brand of comedy to make fun remarks about people's outfits. "There is plenty to make fun of in pop culture without bringing people's bodies into it," she added. Shortly before Kathy's announcement Kelly Osbourne also left the programme. She had been upset with a comment Giuliana Rancic made about Zendaya, who was sporting dreadlocks and Giuliana remarked looked like she would "smell of patchouli oil or weed". Melissa seems convinced the show, which is currently on hiatus, will make it through its current issues. But she remains upset about the impact the problems have had on something her mother loved so much.